Jessie Boys (1881 - 1965) joined the Department of Food and Nutrition in 1917 as an instructor in food preparation. In 1908, Boys received her B.S. from Iowa State College. 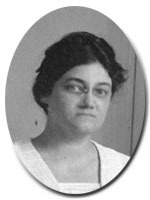 From 1912 to 1913, she worked for the Iowa Extension Service before attending Miss Farmers' School of Cookery, where she studied food preparation and demonstration skills. Boys then taught at Miss Farmers' School and went on to work in the Iowa public schools, teaching sewing as well as cooking. In 1916, Boys enrolled in Teachers College, Columbia University. While she was a student, she also taught courses on foods, physiology, and canning at Morningside College and Rutgers University. In 1920, after completing her M.S. from Teachers College, Boys moved from instructor to assistant professor at Cornell. For the next thirty years, Boys taught "Introduction to Foods," "Elementary Cooking," "Food Preparation," "Food Selection," and "Advanced Food Preparation." Many of Boys' courses were cross-listed as Hotel Administration courses and were requirements for hotel students. From 1922 to 1926, Boys wrote several articles on aspects of cooking and food preparation for the Delineator. In 1928, she earned a diplome from Le Cordon Bleu in Paris. In the 1940s, Boys published pamphlets, bulletins, and leaflets related to World War II on food preservation and healthy eating. Her thesis, Food on the Side of Civilization, was published in l940. Jessie Boys retired on June 30, 1947.